Master List of currently available 4k HDR titles, will be updated often. 4k Blu rays are here, and HDR content is slowly trickling out to various streaming sites as well. And theres really no way to get updated on what gets added, so I decided to make a master list, that along with all you guys, we can keep track of what is available and where to get it from. So whenever something new is added, post it up in here, and I'll edit this 1st post to reflect the newly added HDR content! And when something new is added, I will bold it in RED so it's easier to see. -Regarding UHD BD movies, Feel free to post info though about titles being released if you hear anything, I will add it into the main library when we can actually buy/pre-order them at stores. Fox has already announced that all future releases will be in 4k HDR, looks like sony is going to do the same also as they are starting to release a bunch of remasters in HDR. Lets get this list started, hopefully will be adding more soon!!! As soon as Netflix or any other streaming site is created, we'll add that too! *****note: you must have a 2015 HDR capable tv/ or a samsung with the sek3500 upgrade in order to decode and display HDR content. How your tv displays the HDR contents is dependent on your tv panels capabilities (dimming, nits, color space size). ****Early HDR grades is basically practice, as they get get more practice, content will be graded more efficiently. Where to watch HDR content/What sources support HDR playback?? Heres an article with a great summary of what streaming and physical sources support HDR. How to Redeem Your Code and Where? Check out this NEW thread for those answers as it can get complicating about where/how to redeem! For Better Organization, I made the lists into Spoilers, so click the spoiler to see the full lists of each category! this list has a great layout and goes month by month and is updated daily (by many people too!). I've added a red * in front of movies i find to be reference, in either resolution, HDR, or BOTH. These movies IMO are a great starting point in building a 4k UHD collection!! These are my personal PQ favorites! I'm adding a new list from another website that gets updated more often. It will list whether its from a 2k/4k master, if it has Atmos/dtsX, and whether or not it has DV or just HDR10. -Mobile Suit Gundam Thunderbolt: December Sky. THE LAST REEF: CITIES BENEATH THE SEA. Which movies are coming from true 4K masters? Some of these movies are upscaled from 2k masters, some look good, some are average. For some lists that document the movies/shows from true 4k masters, check these out! where to rent uhd discs? it looks like 3d blu ray rental is gonna offer uhd discs too. Prices are 3.99-7.99 or have a plan. Seems like a pretty decent price compared to a full purchase! FandangoNOW (formerly MGO and currently samsung based). UPDATE DECEMBER 17th, 2015: It appears that MGO/fandagoNOW is now available through the ROKU 4, making it available now to all other tv brands besides samsung. However, because the roku 4 is NOT currently HDR capable, the HDR movies with the vidity spec are not yet available. An HDR update to the ROKU 4 is still possible says ROKU. Also, if mgo has opened up to roku, it means that MGO could be coming to other tv brands soon via the built in app system on those tvs. stay tuned for MGO updates on brand expansion! All amazon is hdr10, some also are dolby vision, which are noted. *it appears that dolby atmos sound has been added to a bunch of titles, check the info on the website to make sure which ones have it. Here is the link for the full VUDU list with additional information about each title. - The Jason Bourne series (all 5 individual titles). DOWNLOADABLE CONTENT: In order to view content you download, you simply download them to your computer and then put them on a USB drive and plug into your tv. Included in this file is 2 Dolby Vision HDR demos, along with 5 HDR10 demos, all are reference quality and HIGHLY recommended!!! In order for these to work, after you complete the download, you must go into the file properties, and change the file name from .lge to .mkv, files won't work without doing this. This is a host site. These are free for everyone. People/companies can shoot and create their own HDR videos and host them here. Click on the link, and on the lower right side of the screen you will find download links that are highlighted in RED, click the link that says 4K DOWNLOAD HDR. If you click on "home" itll take you to the main page where you can find a few more UHD videos (regular UHD). EDIT (APRIL 8TH 2016): Rogers has delayed HDR sports until 2018. Games will continue to be in 4k resolution and look excellent. This an external download box. Movies can be purchased for download. Follow the link for the list of movies! As of November 7th, 2016, youtube now carries HDR videos. However, youtube requires VP9 2.0 for HDR, which is only available on SOME 2016 tvs and some external devices. Currenly, only the newest google Chromecast can access YTHDR. A very great and detailed article on HDR from back in March 2015 I believe. It is around 16 pages long from a magazine and has comparison pictures from "Amazing Spiderman 2", "blacklist" and "Annie". This is the type of link that you will want to bookmark for future references on HDR. If you have access to the comcast XFINITY app, they will be offering the opening and closing ceremonies of the RIO OLYMPICS in 4k HDR. As of right now, only Samsung and LG tvs have access to this app. turls, CINERAMAX, Rudy1 and 103 others like this. Last edited by ray0414; 08-15-2018 at 07:59 PM. 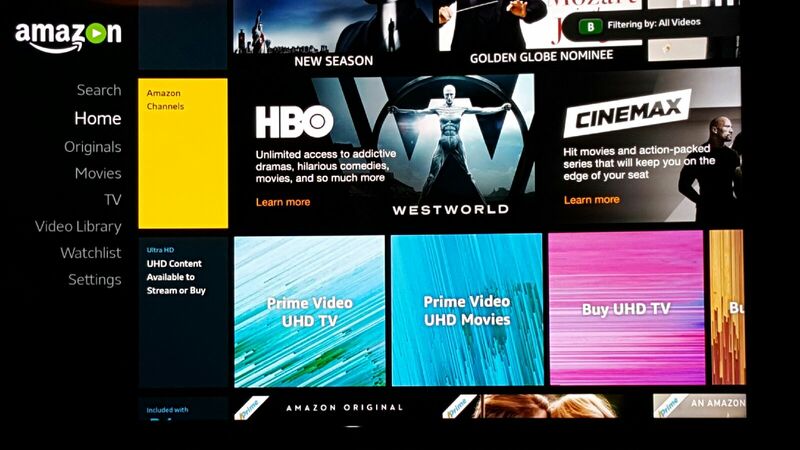 updated UI from amazon, theyve made it very easy to switch between the diffferent UHD sections. see pictures below! 1. 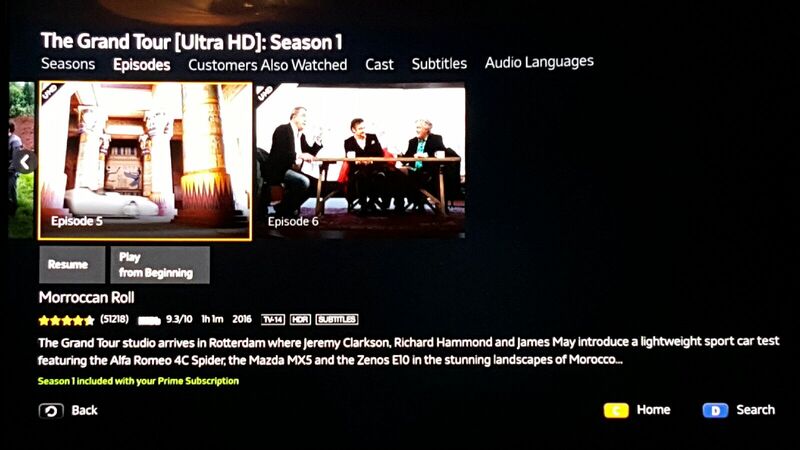 Locate UHD section on main Amazon page. 2. Enter UHD section. Now you have 4 different sections to choose from. 3. After choosing a section, you can locate if a movie or show is HDR by the HDR icon in the title info as seen here. Some will say "vision" for Dolby Vision, or "HDR" for regular HDR10. the HDR icon is located between the Age rating and SUBTITLE options. HOW TO FIND HDR CONTENT ON AMAZON. There is a lot of confusion about how to access HDR content on amazon. Amazon around november 20th revamped their UI and IMO for the worse. It now makes it extremely difficult to find the UHD material, and its even more trickier to find the HDR content. If you do not go directly to the UHD section, your tv will play the show in only HD/1080P. to find the HDR tv shows/movies. simply scroll all the way down to the bottom of the categories. There will be a section called "Ultra HD movies" and "Ultra HD TV shows". 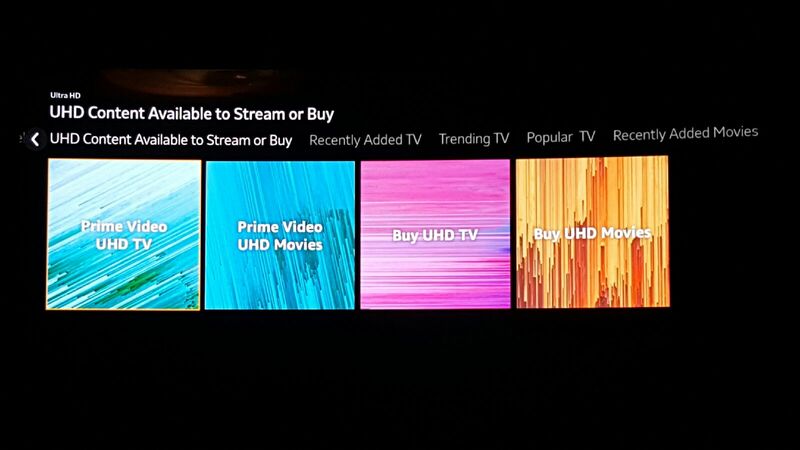 You MUST go to these specific categories to see any UHD or HDR stuff. 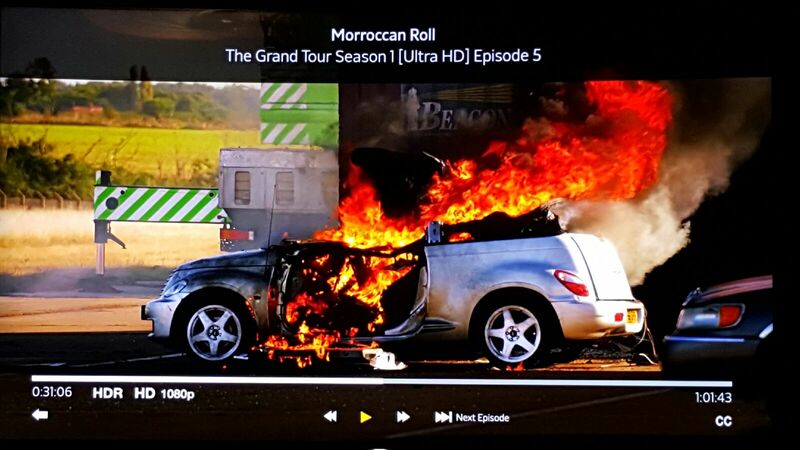 Unfortunately, this is the only way to know if what you are watching on amazon is in HDR. if you do not have an HDR tv, you will not see an HDR badge. Hopefully amazon in the future will make it easier to find HDR stuff. aaronwt, hughh, TimWelborn and 22 others like this. Last edited by ray0414; 12-26-2016 at 09:14 PM. i'm pretty sure the full season of The Man in the High Castle (Amazon Prime) should be in HDR. the pilot was in HDR, however, since they updated the preview with the 2nd episode, both episodes are showing in regular 4K. hopefully it's still HDR once released November 20th. CCsoftball7 and ray0414 like this. U know I checked that a few times and I never seen the hdr tag in the movie info. Definitely keep an eye on it and see what happens! Great thread, I watched Man in the High Castle(Great show btw) and only saw it as 4k, would look nice in HDR I am sure. How do you play the 3D demos? Do we need to download them to a USB stick and plug them into the TV or can a smart TV play an mp4 file directly in some way? The links I provided from the demo 3d site are all HDR demos, so yes you download them and then put them on a USB drive. I believe that site tho does offer actual 3d clips if your interested, there's a category bar on the left side on the main page of demo3d. Pretty garbage offerings so far, although I have purchased Amazing Spider Man 2, Fury, and After Earth. Seen enough of the tech to know it's good and will restrain myself from purchasing any more junk movies just to check out the picture quality. Will be nice once Amazon starts offering new releases on digital in 4K w/HDR. Would buy the new Mission Impossible in a heart beat. Ultraflix went live on Samsung Tvs this morning. Waiting for confirmation from Sony crowd and lg that they also received the update. Appears to only be 4k right now, but theyve already stated they want to have the largest hdr library as well. I decided to bite the bullet on Smurfs 2 on amazon to see how the HDR grade was, ive checked out the 4k version on netflix a few times, so i had an idea of how the regular 4k version looked. the Amazon HDR version EASILY trumps the 4k netflix version. the expanded colors create an entirely different picture with crazy depth to it. Not to mention, Smurfs2 has one of the best resolution grades so unlike alot of other "4k" films, smurfs 2 actually looks like real 4k and with the HDR grades, creates quite an amazing. Definitely the closest to "reference quality" as far as 4k HDR that i have seen. just for fun i did match up a few scenes with some pictures I had previously taken with the 4k version on netflix. I do see HDR becoming a very expensive hobby once the big name titles start to arrive! anthonymoody, brickyardz, papaleo and 5 others like this. Last edited by ray0414; 11-12-2015 at 09:40 PM. Have you watched Bosch? It's a great show. How did you determine this? I don't see any flags on the Vudu website. Thank you! Nah, the HDR on it is really screwed up and I can't even get the regular 4K versions of it, so I'll just wait until it gets sorted out. I checked out the show Z about Zelda fitzgerald last night. The show didn't really tickle my fancy, but oh my god the picture was stunning. Might have been the most impressive 4K video/movie content I've seen to date. You can really see the difference in the shots of the sky where it's bright as hell but not blown out at all. That good girls revolt show is total garbage all around, picture quality looked dull and the show was awful. Only the vizio R can see the flags. Multiple articles from a few weeks ago confirmed these were their dolby vision 1st releases. EDIT: I think what your looking for is the vudu uhd website, because the regular vudu site doesn't mention uhd or hdr. Last edited by ray0414; 11-13-2015 at 10:10 AM. It may be out of scope for this thread, but it would be cool to list the hardware platforms that support each category (e.g., under vudu note that it's only supported on Vizio R tvs, etc.)? Recommended podcasts: The Next Picture Show, /filmcast, AV Rant. Ill see what I can do without making the list itself look sloppy or too complicated. Pretty garbage offerings so far... will restrain myself from purchasing any more junk movies just to check out the picture quality. Yes I agree there are quite a few shows/movies on these lists that probably do not need to be in HDR (as they are/were not that good), however, I did see quite a few shows/movies that I would consider excellent choices. Please consider adding my 3 minute 4K HDR demo reel to the master list. Here is the link to it. nathan_h, brickyardz, denpom and 2 others like this. Last edited by Tom Roper; 11-14-2015 at 09:06 PM. When Amazon first came out with HDR I could see a big difference, they have done something to mess it up and now it looks worse than the 4K non-HDR versions. I don't think Amazon HDR is close to what we will see on the HDR Bluray players coming out and hope Netflix does a better job than Amazon. I have a LG oled but before I sold my JS9500 the HDR which looked amazing at first from Amazon, looked horrible just as it does on the OLED. MGO was far superior and is the in thing I miss about owning a Samsung 4K set. Z: the beginning of Everything looks excellent. Why can't Amazon do the with all HDR offerings? Last edited by CMPOLED; 11-15-2015 at 08:51 AM. Tom Roper, brickyardz and ray0414 like this. it looks as good as ever and it's quite excellent, far from whatever you're describing. don't expect HDR miracles on OLED. You sure its not an issue with how LG has their HDR settings configured? have you bought any of the amazon movies that are done by sony? i have i think 4 now, and they are definitely superior to MGO, in both resolution and the HDR color grading. the MGO stuff looks good, but it seems more like really good 1080P than 4k HDR. even pineapple express HDR has moments of briliant HDR work that looks awesome. the sony HDR movies have more "WOW" factor than the tv shows, but the tv shows to me still look pretty good. I 100% agree though that 4k HDR discs are going to be the go-to for visual perfection. Thanks Tom! I added a section for you in the list! Considering the mgo stuff is nearing 100 gb in size, its safe to guess that they are probably the same exact files as what will be placed on 4k blu Ray discs given their size limitations. Quality issues are foxs fault since that's all that is on mgo. Incidentally, all the "wow" stuff is a different studio - Sony. I think there's going to be a wide range of quality of HDR content as studios experiment with grading techniques and styles, especially here at the beginning. And of course it's also worth remembering that like 90% of content out there was mastered at 2K. Hell, Jurassic world had a DI of 2k so there will never be a 4k version of it. ray0414 and Pencreus like this. somebody just 2 days ago posted in one of the HDR threads in the news section that they were able to take those files and completely break them down on their computer, they posted a screen shot and apparently the file contains a 4k version, a 1080P version, a 720p version and a SD version. it also breaks down the sizes of each, and apparently the 4k hdr version of mazerunner ( i think that was the example), is actually only 35G. i agree, fox is not doing a good job and SONY seems to know what they are doing. I prefer the quality of all the sony HDR stuff ive seen. Tom Roper's HDR video is better than MGO! I actually seen alot of similarities between Toms video and After Earth HDR (sony). Tom Roper and King Richard like this. That's really interesting about the mgo stuff having multiple files. Seems a little ridiculous and unnecessary so I'm not quite sure what the deal is with that. Nevertheless, 35 gb for a 4k movie is still bigger than the amazon movies with their relatively low bitrates (and better quality at that), so I'd still say fox and not mgo is to blame. Also I think exodus might be the only movie on mgo that is true 4k. The rest are 2k DIs that will never be in 4k. fox doesnt produce great movies anyways. so its a good thing that sony (who does produce good movies) is very good at the entire HDR process. hopefully the other studios (paramount, universal, disney) are in sonys league and not foxs' league. Go to first new post Source for U or pit sectionals?